Aluminized Built from heavy duty aluminized steel our Installer Series performance exhaust systems offer a value price without compromising on the quality built into every component. While the seams are a major point of rust through with some budget systems our fully sealed tubing adds years to your system. Constructed to the same specifications as our top of the line Pro Series we back this line with an industry leading 3 Year Warranty. Stainless Steel MBRP's XP Series is the performance exhaust of choice for the enthusiast who needs a system that can take anything that the road throws at it. This system's rugged sixteen gauge T409 construction can be counted on to withstand everything from salt to rocks, tar to grime. We have had such success with this line that we back it with a Lifetime Warranty. Please Note: This series may, with time, develop surface rust which is not covered by the warranty. Wintry road conditions and road treatments may accelerate this process. Black Tips Our Black Series performance exhaust systems offer a true murdered-out style without compromising on quality and performance. With fully sealed seams to resist rust you can count on this system to really hold up. The black coat finish is specifically formulated to withstand the extreme heat and abrasive conditions an exhaust system is exposed to. Built to Perform MBRP's performance exhaust systems are built to perform. Designed to maximize exhaust flow and minimize exhaust temperatures your ride will use less gas, last longer and perform better. Every system we sell has been built to the most exacting standards in the industry. Dyno Proven Your MBRP muscle car system has undergone countless hours on our in-house Mustang 1100 AWD-SE Chassis Dynomometer, hundreds of miles on road and track and numerous tweaks and modifications to get maximum performance. 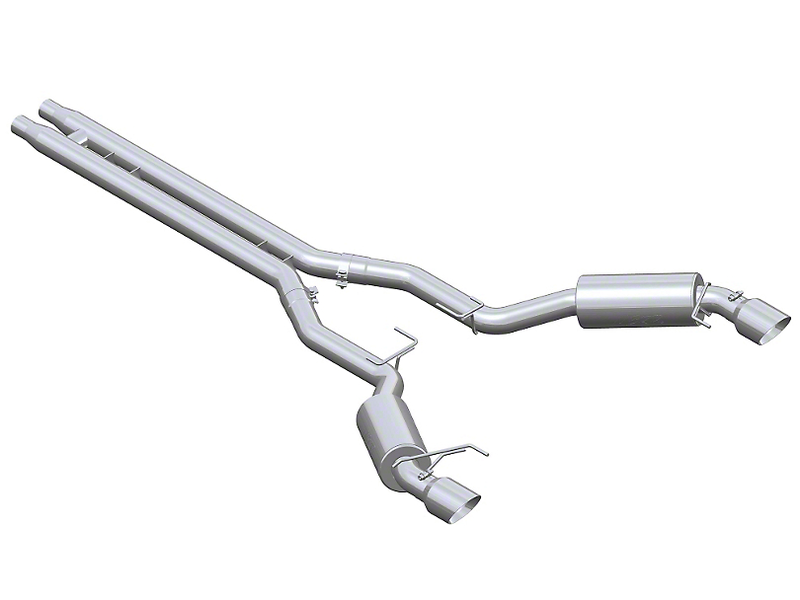 From the vehicle specific muffler design to the fully mandrel bent tubing to minimal bend degree angles, your MBRP performance system gets exhaust out fast. An MBRP performance exhaust system is the starting point to getting the most from cold air intakes, programmers, modules and downloaders. Easy Installation MBRP systems are as much fun to install as to drive with on your muscle car. Bolt-on, no weld design makes installation a no hassle one and a half to two hour project. Everything is direct fit to the OEM hangers and you get all the clamps and parts you will need, all in one box. Sound & Style Performance is one thing but at MBRP we believe that appearance and sound are just as important. 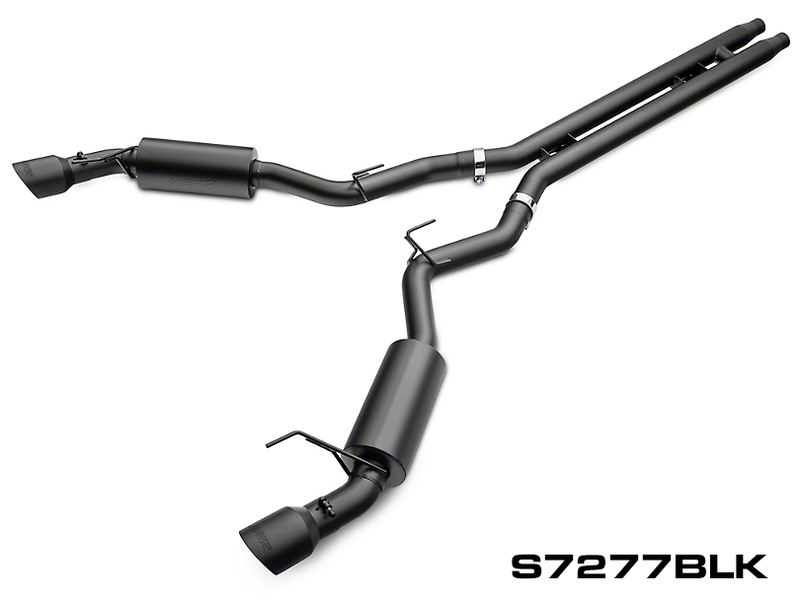 Every MBRP performance exhaust system has been specifically tuned to get the optimal sound from your ride. Civilized when you need it to be and seriously aggressive when you want it, it is all classic muscle car. With our stamped logo on the tip and our unmistakable styling, there's no question that you have the hottest performance exhaust on the road - MBRP. 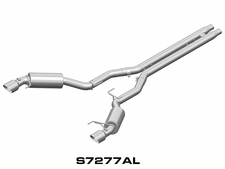 Aluminized Built from heavy duty aluminized steel our Installer Series performance exhaust systems offer a value price without compromising on the quality built into every component. While the seams are a major point of rust through with some budget systems our fully sealed tubing adds years to your system. Constructed to the same specifications as our top of the line Pro Series we back this line with an industry leading 3 Year Warranty. Stainless Steel MBRP's XP Series is the performance exhaust of choice for the enthusiast who needs a system that can take anything that the road throws at it. This system's rugged sixteen gauge T409 construction can be counted on to withstand everything from salt to rocks, tar to grime. We have had such success with this line that we back it with a Lifetime Warranty. Please Note: This series may, with time, develop surface rust which is not covered by the warranty. Wintry road conditions and road treatments may accelerate this process. Black Tips Our Black Series performance exhaust systems offer a true murdered-out style without compromising on quality and performance. With fully sealed seams to resist rust you can count on this system to really hold up. The black coat finish is specifically formulated to withstand the extreme heat and abrasive conditions an exhaust system is exposed to. Built to Perform MBRP's performance exhaust systems are built to perform. Designed to maximize exhaust flow and minimize exhaust temperatures your ride will use less gas, last longer and perform better. Every system we sell has been built to the most exacting standards in the industry. Dyno Proven Your MBRP muscle car system has undergone countless hours on our in-house Mustang 1100 AWD-SE Chassis Dynomometer, hundreds of miles on road and track and numerous tweaks and modifications to get maximum performance. From the vehicle specific muffler design to the fully mandrel bent tubing to minimal bend degree angles, your MBRP performance system gets exhaust out fast. An MBRP performance exhaust system is the starting point to getting the most from cold air intakes, programmers, modules and downloaders. Easy Installation MBRP systems are as much fun to install as to drive with on your muscle car. Bolt-on, no weld design makes installation a no hassle one and a half to two hour project. Everything is direct fit to the OEM hangers and you get all the clamps and parts you will need, all in one box. Sound & Style Performance is one thing but at MBRP we believe that appearance and sound are just as important. 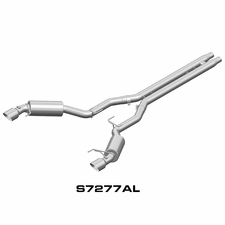 Every MBRP performance exhaust system has been specifically tuned to get the optimal sound from your ride. Civilized when you need it to be and seriously aggressive when you want it, it is all classic muscle car. With our stamped logo on the tip and our unmistakable styling, there's no question that you have the hottest performance exhaust on the road - MBRP.